Today we celebrate one of the most attractive of English saints, Hugh of Lincoln. When I say English I mean English by adoption, for he was actually born in Burgundy. He was professed as an Augustinian canon but was so impressed by a visit to La Grande Chartreuse that, at the age of 25, he transferred to the Carthusians, the austere Order recently founded by St Bruno. We don’t know much about the next ten years, presumably because he lived a strict life of solitude, prayer and manual work. His biographer stated how all sorts of animals were attracted to the garden outside his cell. 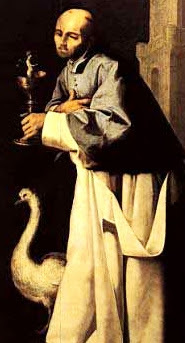 The saints often have close relations with the natural world and it is fitting that one of St Hugh’s symbols is a swan, referring to the beautiful story of the swan of Stowe (where the saint had a manor) which was inseparable from him and even guarded him while he slept. Things changed in 1180, when he was chosen to be Prior of the first Carthusian monastery in England – founded by Henry II at Witham, Somerset, in reparation for the murder of St Thomas Becket. He soon became a respected spiritual master, consulted by the King (who was often in the area hunting) and many nobles, and it is little surprising that in 1186 he was appointed bishop of Lincoln. St Hugh reluctantly accepted out of obedience, though he often returned to his Charterhouse for periods of reflection. St Hugh died on 16 November 1200 at his London residence in Holborn. King John himself helped carry the coffin to its resting place in Lincoln Cathedral and, twenty years later, Bishop Hugh became the first Carthusian saint. Today is one of those irritating days when there are four very worthy options in the Ordinary Form here in England and Wales - SS Elizabeth of Hungary, Hilda of Whitby and Hugh of Lincoln, and the Saturday Mass of Our Lady. I suppose the fairest thing would be to alternate! To my mind, that is one of the deficiencies of the 1970 calendar. Of course it is consistent with the Novus Ordo obsession with choosing between options. Since St. Elizabeth is very popular in Germany (where she spent most of her life; here she is called St. Elizabeth of Thuringia [Thüringen]), we have kept the traditional date of September 19th (in my archdiocese of Berlin, her memoria is elevated to the rank of festum). On the 17the, we celebrate St. Gertrude of Helfta, whose commemoration in the universal calendar is, I believe, one day earlier. Oh, and I didn't know anything beyond the name about St. Hugh of Lincoln, so thank you very much for the article, I have taken an immediate linking. Margaret of Scotland isn't commemorated on 16th November in England? Is her June feast used? She is commemorated in England & Wales on 16 November, together with St Edmund, as an optional memoria. However, in Westminster St Edmund is a memoria - so sadly St Margaret of Scotland doesn't get a look in.